GRAND CANYON, Ariz.—When the National Park Service saw visitation at the Grand Canyon climb to 1 million people in 1956, the agency realized the park would need more water to meet the demand. But it wasn’t a simple task. Engineers were challenged to construct a 12.5-mile pipeline from the North Rim, dropping into and traversing the canyon, before climbing 3,000 feet up to the South Rim. While the view for the workers would be majestic, installing the aluminum pipe in the rugged, unforgiving terrain would require the best technology of the time. 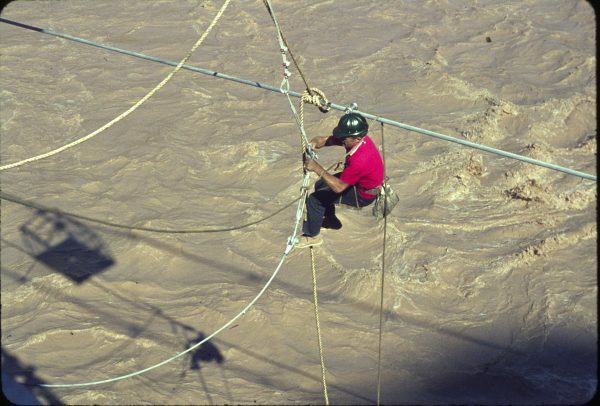 Construction on the Trans-Canyon Water Distribution Pipeline began in 1965 and, after rebuilding work following a catastrophic flood in 1966, water began flowing in 1970. It was considered an engineering marvel at the time, and still is today. The pipeline is now past its expected lifespan. Breaks are becoming more frequent, and repairs are costly and dangerous. A replacement has been on the deferred maintenance list for years, but politicians continue to kick the can down the road. It’s a risky game because if the pipe fails, it might mean a temporary shutdown for America’s most treasured natural wonder. Repairs to the Trans-Canyon pipeline aren’t new. The conduit is exposed in many sections, leaving it vulnerable to the natural erosion process of the canyon. That includes rockslides, mudslides, and flooding. But as the pipe has aged, the frequency of the breaks has increased. “That makes sense—as you do more repairs, you have more weak spots,” Donna Richardson, acting chief of facilities and maintenance at the Grand Canyon, said in an interview with The Epoch Times. While Richardson estimates there are about 12 to 20 breaks per year on average, she said repair records aren’t well-kept, so exact figures aren’t available. 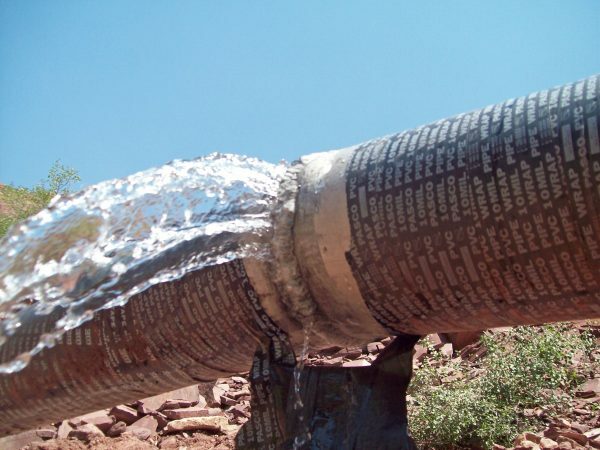 And that doesn’t include pinhole leaks, called sprayers, which aren’t repaired until the leak affects pressure in the pipe or impedes trail access. The process for her team to address breaks is complicated and dangerous. A helicopter is required for almost every repair, to bring in crews and equipment. Many of the breaks occur in an area known as “The Box” on the North Kaibab Trail, where narrow trails and rock cliffs make it particularly perilous. When crews are dispatched for repairs, water to the entire line must be shut off, and the pipe drained. During this time, the park relies on 14-million-gallon storage tanks and initiates water-conservation protocols. “If we didn’t have that storage, we would really be in trouble,” Richardson said. The tanks hold enough water for five to six days during peak season, and up to 10 days in the off-season, according to Richardson. If the pipe isn’t back in service before the stored water runs out, the South Rim could run dry for visitor use and fire suppression. There are no such outages on record, but the canyon came close in 1995 when a flood kept the pipeline offline for 28 days. 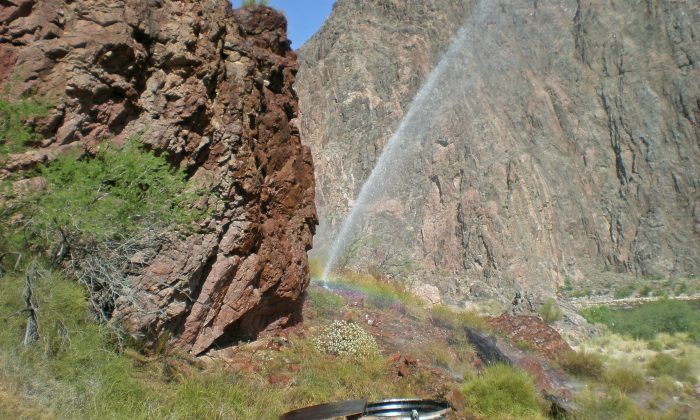 Water had to be trucked to the South Rim until repairs were complete. Getting water flowing through the pipeline after a repair is a challenge. Differences in daytime and night temperatures stress the metal pipe’s welds and bends, so water must be let back in slowly. A valve can only be turned incrementally every five minutes to ensure that the pressure and temperature don’t create new problems. Richardson said it takes more than three hours to fill the pipe. And it’s not always a success on the first try. “As careful as the crews are, that’s where we are seeing the repetitive breaks,” Richardson said. Recently, there was a series of four breaks before the pipe finally was back in service. Richardson and her crew are successful at keeping the aging pipeline up and running. But as the frequency of breaks continues to increase, conversations about replacing the pipe are gaining traction. On Oct. 10, NPS released an environmental assessment that outlined three options. Option A would keep the status quo, repairing the pipe when it breaks and hoping nothing catastrophic happens. 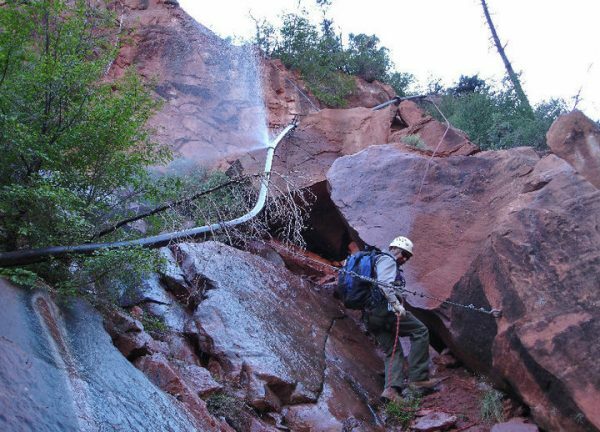 Option B would relocate the water-intake valve, add a new water treatment plant, pump station, and storage tank, and replace a three-mile section of the pipe between Phantom Ranch and Indian Garden. Construction would last an estimated four to five years, with work inside the canyon occurring over a three-year period. Contractors would expand a helipad, create a new staging area, and pave a new access road, all totaling roughly 15 acres. 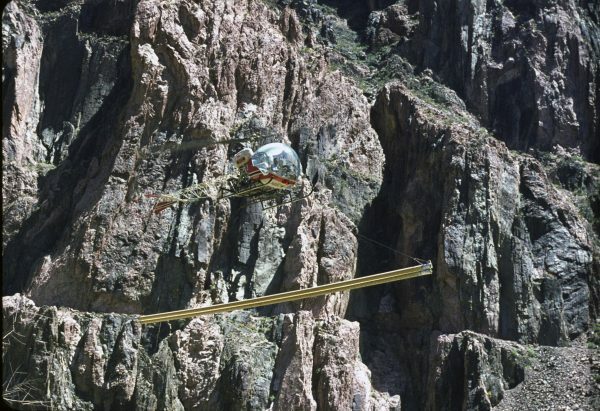 Helicopter flights would increase to about 3,300 per year from 1,200-1,500 during the inner-canyon construction. The pipeline would have to be shut periodically during construction, which could lead to water restrictions. Option C would replace the entire 12.5 miles of the Trans-Canyon pipeline. The new pipe would be eight inches in diameter, instead of the current six inches, and NPS would use steel or, “another durable pipe material.” Construction would last five to six years, with four to five years inside the canyon. During that inner-canyon work, helicopter flights would more than double to an estimated 3,800 per year from the current 1,200-1,500. The assessment lists Alternative B as the preferred project, but the final decision rests with the public. NPS is reviewing feedback from an open comment period that ended Nov. 10 to determine if further evaluation is needed. Funding of $74 million to $124 million has already been secured, according to Kris Provenzano, Grand Canyon program manager at NPS’s regional office in Denver.